New Poem: The Fort Pitt Tunnel « Think, Kid, Think! For kids like me and my siblings, the Fort Pitt Tunnel wasn’t just a logical transportation route. It was a competitive physical challenge. The challenge, of course, was to see which of us could hold our breath through the entire tunnel, from shadowy first entrance to final explosion of light. At 3,614 feet, a car could theoretically drive through at 55mph in about 45 seconds under perfect conditions, so the challenge was not impossible. But in modest-to-heavy traffic, as an 8-year-old, while chewing a foot of bubble tape, with someone tickling you, it was pretty tough. Embedded video may display advertising on initial view. Please ignore or click to close. On a less happy note, I timed this post to mark the official conclusion of the twentieth consecutive losing season (1993-2012) for Major League Baseball’s Pittsburgh Pirates. The team contended for most of the 2012 season, but for the second year in a row collapsed at the end with a dismal 17-37 record in the final third of the season. Even winning 20 of those last 54 games (still awful) would have earned them 82+ wins for the first time since Barry Bonds left town. Pirates fans must be running out of breath. Hopefully their time in the Tunnell tunnel will come to an end soon. Great poem, and loved that view of the city as you emerge from the tunnel! Love it! Very clever poem! Fun poem, Ed! Reminds me of my trips through the Boston tunnels, although much more spectacular. Also, my condolences on the Pirates; my Sox wrapped up their own dismal season (69-93) with a 14-2 loss to the dreaded Yankees. (We haven’t had a season that bad since ’65) So thanks for the smile! As usual, a marvelous presentation. It smarted just a little to see the political ads. Your poem reminds me that Blurb.com now has a way of publishing an e-book which includes links to graphics and video! Isn’t this what you just did! There were embedded Google ads inside the YouTube video to which you linked. The only way to prevent ads such as those from appearing is to host your own video, which your hosting site may not allow you to do anyhow. Thanks. I saw an ad the first time that I viewed the video on YouTube (but quickly clicked to close it), and then never saw them once I embedded it. I’ll add a note. I did – I held my breath while scrolling, scrolling all the way down. . . . What fun – I love how you capture the feeling of a KID in this situation, and how the poem is interactive. Thanks for sharing. Congratulations! Who was doing the tickling? And what flavor of bubble tape? I did it! Love the gum and the tickling and the concrete poem. Kids will adore this. OK, me, too. Thanks, Laura! I think next time I’m in Pittsburgh I’ll try to drive through the tunnel and actually record the poem live. Better yet, maybe I’ll launch a contest where kids can record themselves reciting the poem while their parents drive through the tunnel. That would be hilarious. Anyone have an in at the Pittsburgh Post-Gazette? It’s the only print pub that I can think of that might actually be able to fit the poem on one of its pages, and that might be able to facilitate such a contest. Ooh, I just thought of someone … stay tuned! Wonder where that holding one’s breath started. We have lots of tunnels in the mountains & my students never failed to try, even in the long ones. I didn’t know about your tunnel, which is awesome, the way you have the view at the end into the city, Ed. I love that you made the lo-o-ng trail within the poem. Very nice. There must be some innate response to a tunnel that makes kids want to hold their breath through it. No way it started with one person and then spread as an idea. Interesting to think about what within us would prompt us to do something like this. Thanks for reading and commenting, Linda. I remember that tunnel well! You are so right about the sudden burst of sunshine on the out. Cute poem! Thanks, Andi! The video actually does a great job of capturing the light burst. Your poem perfectly mirrors that forever-tunnel-feeling! I love it when shape poems do that…. As for me, I always held my breath when driving past graveyards (so the spirits wouldn’t get up my nose). Tunnels still freak me out. I know they will cave in on me. Thank you for the smile. ‘Glad I live in the country! a. See, we never did the graveyard thing that I can recall. For some reason I’ve never minded tunnels that go through mountains, but those that went under water (like the path from Detroit to Windsor) always made me nervous. Visited Pittsburgh for the first time a few weeks ago. If I’d read your poem before then, would have checked out the tunnel. Loved the yellow bridges — sorry to hear about the Pirates. The bridges really do look cool. Walkable, too. What were you doing in Pittsburgh? Very clever, Ed, and of course I love the perfect meter. There are hundreds of tunnels blasted through mountains in these parts, particularly once you get up north in Liguria. On the way to France one time, I decided to count how many such tunnels we went through from our town to Menton, France, just across the border — got to something like 115. And there’s even one that is about 17 km looooong. I didn’t hold my breath, though, as I would have turned blue. Hi Renée. Thanks for the compliment! Ha! This made me laugh – our kids have done this breath holding for the Lincoln Tunnel and then any other tunnel we ever travelled through, too. I actually miss that, now that they are young adults and would never deign to revert to their charming childhood selves. Funny that it’s always a tunnel that elicits this in children. Oh, I bet you could still entice them all to hop in your car and give it a go. Thanks for stopping by, Tara. Thanks, Vikram. I did try to draw the length of the “tunnel” so that if people read the tunnel part as they would read normal words it would take about 60 to 75 seconds to read the entire poem. So it’s not supposed to be easy! Perfect in every way! LOVE it!! 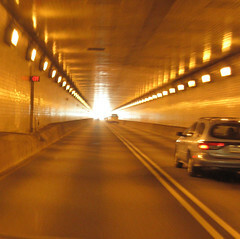 Tunnels make me nervous… I think I’ve driven through a few tunnels that exactly resemble the tunnel in your poem. I think that I would be nervous to go through a long, twisty tunnel as well; straight ones I’m okay with (other than the underwater ones mentioned earlier in the comments). Thanks for visiting and commenting, Katya. You’re right, Iza. That doesn’t count. But your subscription does count! Ed, As a 25-year Pittsburgher, I love the poem! I got the samw “Wow!” experience when I emerged fromt he tunnel in a cab from the airport for my KDKA job interview. For some reason, commuters insist on slowing waaaay down at the entrance…making the tunnel seem even longer than the circuitous path through your poem. Ed, I loved the poam and thanks for the video. Now I’ve entered Pittsburgh. We don’t have too many tunnels here in New England. Our kids hold their breath passing cemeteries! Hi Joyce. Thanks for reading and commenting. You’ve joined a number of other people who say that they (or their kids) hold their breath by cemeteries. Anyone recall other less popular breath-holding locations out there that we should all know about? Underwater locations do not count. hi uncle eddy miss you very much and Ireally love your poem!!!!!!!!!!!!!!!!!!!!!!!!!!!!!! Hi Sarah! Miss you, too. Thanks for visiting — make sure you stop by next week when the big tournament begins. There will be 32 new poems posted on Wednesday morning and another 32 posted on Thursday morning! Linda, Ed…we all got here through a tunnel. On the first day we TOOK a breath. So holding our breath may be more of a natural response than we realized. Loved the poem Ed, and the trip. Oh, gosh, Ed, what a great poem and tunnel experience! When I was a kid we lived in Napa, California. I used to compete with my twin sister to see who could hold her breath longer while going through a long tunnel on our way to San Francisco. (I cheated…which I’m confessing for the first time here!) Thanks. I remember all of us (me and my siblings) trying to cheat, too. Like we’d puff up our cheeks as if holding our breath and then still try to breath slowly through our noses — as if that was an undetectable trick.